Thanksgiving has come and gone, but it is still the perfect time to offer a heartfelt thank you for all of your accomplishments this year: full accreditation for our medical school, GME accreditation, a record number of applicants — 6,779! — and the opening of a new research building. We also celebrated our 10-year anniversary as a college. 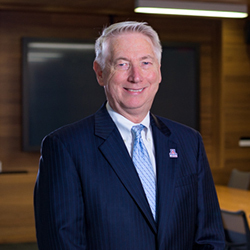 All these successes are a testament to the vision and determination of our faculty, staff, students and our University of Arizona and Phoenix communities. I take pride in knowing that this would not be possible without the hard work of so many individuals on our campus. I am grateful for your dedication to the UA College of Medicine – Phoenix. In 2017, we celebrated the opening of a state-of-the-art research building, the Biomedical Sciences Partnership Building. The building serves as a hub for health care discovery and medical research, housing scientists with a myriad of backgrounds. I am thankful for the research that’s being done there, and just a stone’s throw away, at the Arizona Biomedical Collaborative Building, as well. These laboratories allow our researchers to continue their work to improve health care in Arizona and beyond. On Dec. 5, we celebrated all of our achievements with a Founder’s Reception and Open House. As we wrapped up our 10-year anniversary celebrations, it was a perfect time to honor the enormous contributions of our founding faculty, staff and students. I hope you were there to celebrate their — and your — dedication, vision and hard work at this holiday reception. We looked back at the past 10 years and looked forward to tomorrow. I urge you to join me in continuing to celebrate our successes.